Hello, someone in the room can give me a hand identifying this typography. 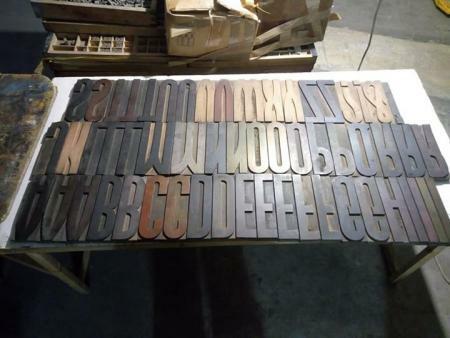 I do not have any type specimen of wood type. Paul, thank you very much. Where did Edel Grotesk come into the picture?????? Rick, I once owned this same face in wood and was told the name by the previous owner. It was European height so I donated it to Central Print. They intend to have it planed to .918. And posterity thanks you for donating it to Central Print in St. Louis. Paul I suspect the European stuff you gave central print is probably this stuff. The A looks like Aurora but the rest does not match it. A little late to get back to this, but I just realized that I have some handset metal fonts of both Aurora Condensed and Aurora Bold Condensed in my shop and my files tell me that this design was introduced by the Weber typefoundry (Germany) in 1928. I also have a font of Aurora originated by the J.G. Schelter & Giesecke foundry (Germany again) in the 1880’s. This was one of my very first fonts and is still the most ornamental “victorian” flavored font in my collection of over 2,000 handset fonts.